Virtual reality is still an unexplored frontier when it comes to interactive storytelling. Most experiences that players sit through are modeled for the average height and even titles such as Robinson: The Journey that experiment with traversing around massively scaled dinosaurs. By shrinking down the adventure to something a bit more pocket-sized, the team at Polyarc Games has come up with a brand new form of virtual immersion. Moss, presumably the first part of a new PSVR-exclusive adventure series, starts a new chapter geared towards fans of Redwall and fantasy of all sorts. Enter Quill: a plucky little field mouse that dreams of grand adventure after reading through adventurous tales with her uncle. Like so many storybook adventures, Quill’s only family is kidnapped and sends her off on a journey to rescue that who she holds so dear. Through the guiding hands of The Reader (that’s you), the adventure of Moss is going to require some teamwork if Quill stands any chance at playing the part of the heroine. Billed as the first book of Moss, Quill’s simple yet charming persona is something I had a lot of fun playing alongside. Quill might not be able to speak at the reader, but her chitter and use of sign language are sometimes all I needed to solve the environmental puzzles keeping me from my next destination. Even without words, there’s an unspoken bond between Quill and The Reader that really sets up for a great sense of immersion in this small-scale adventure. By the way, any game where I can get a virtual high-five for solving a puzzle is alright in my book. 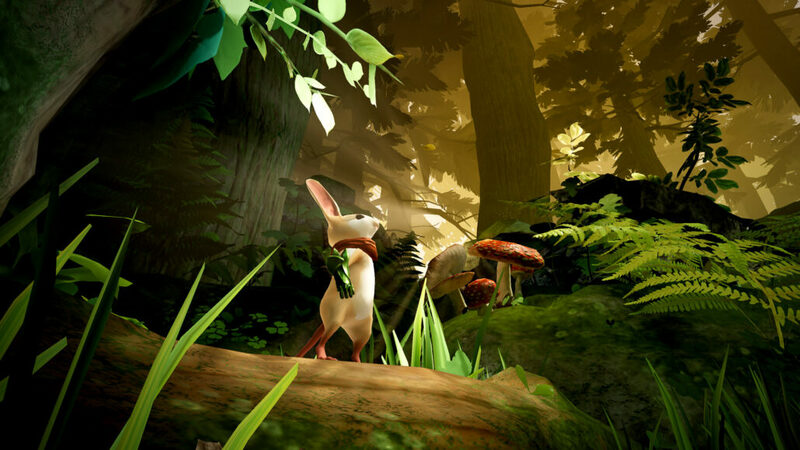 From a comfort standpoint, Moss is one of the few PSVR titles that should appeal to any player, regardless of how much comfort and exposure they have with the platform. Movement between scenes and camera control is taken out of the players’ hands, instead allowing the player to observe from afar as if they’re reading an elaborate pop-up book. After so many first-person experiences, it’s refreshing to play a VR game in third person view, even if Moss wasn’t the first title on the platform to attempt such a viewpoint (Theseus comes to mind as one of the first on PSVR). Scene transitions are simple black wipes and teleportation, meaning no risk of discomfort as Quill moves from one scene to the next. All of the environments are beautifully modeled and imbue Quill’s adventure with a sense of scale from the littlest field mouse up to towering structures left behind in a world seemingly devoid of human interference. The player is free to move their head about the environment to peer in on Quill at any angle, not to mention there’s a quick and easy trophy to using The Reader’s face to smash up some objects. Combat is a main focus of Moss, but it’s been developed in a way to be accessible to all audiences. 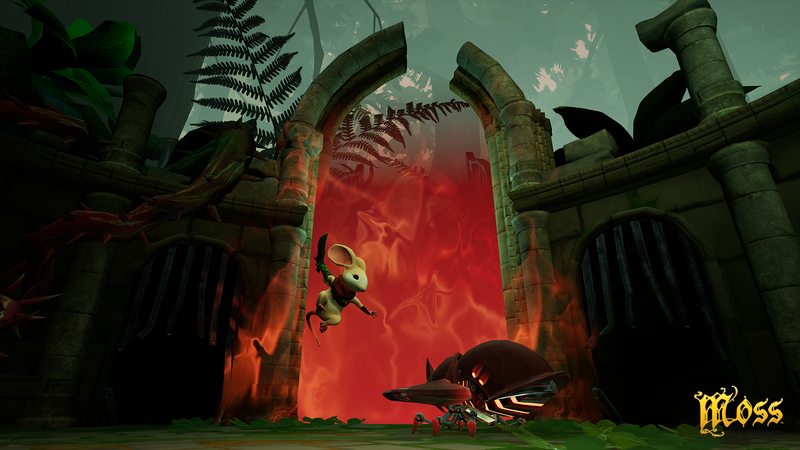 Where the player DOES interact is through a combination of using their powers as a silent overseer to guide the adventure or through controlling Quill directly, using only a fraction of the DualShock 4 to guide the intrepid little heroine through platforming challenges via climbing and parkour, as well as a dashing bit of swordplay when spiky vines and evil insects stand in her way. She’s never quite alone, as the player also has their fair share of the journey by interacting with objects to create new pathways throughout the environments or grasping at and using enemies as solutions to the various environmental puzzles. Moss truly shines as both Reader and Quill have to use their abilities in tandem to traverse the environment. There’s an unspoken bond between both the player and the main character that makes the player feel like they’re truly a part of the story instead of just a passive onlooker. The world-building to Moss is something of a marvel that fits so perfectly with Quill’s little world. Humanity appears to have long left the forests and fantasy setting of Moss, leaving only remnants behind. Carelessly discarded armors and stone structures litter the forest landscape, leaving the impression that Moss is set within a purely fantasy setting if it weren’t for the levitating sentries and power cables within the final castle. If Book Two of Moss features a technological shift into some more futuristic technology, it wouldn’t be a complete surprise. Moss is one of those rare PSVR experiences capable of leaving the player so engaged and interested in the world they’ve created that the ending comes at such an expected time. After a series of trials by combat and platforming, Quill finally reaches the one she’s been chasing down the entire adventure. Rather than a storybook happy ending, what the player gets instead is simply an ending. I was left wondering ‘is that it?’ as the credits began to roll, only to be greeted with a message telling me that it was the end of Book One. Moss still clocked in at nearly twice the length of FATED: The Silent Oath, but both titles seemed to end on a cliffhanger just as the story is rising towards a climactic encounter. Can I recommend Moss as a PlayStation VR essential? Absolutely. The charm of Quill and the storybook fantasy appearing right before our eyes should appeal to anyone that could put on the VR headset. Moss’ price may be a little high for the length of the adventure, but what is there for Quill’s first adventure includes some of the finest hours I’ve spent inside the PlayStation VR all year. I honestly can’t wait to see what’s to come in the second book of Moss! Reviewed on PlayStation 4 Pro (via PSVR), code provided by the publisher. You can purchase the digital code via GameStop. Billed as the first part of Quill's storybook adventures, Moss showcases some of the best ideas to grace the PlayStation VR since its inception. Not only is it comfortable and easy to get into, but the forest world that Quill calls her home is a character all its own.